Description: In Stormheim, on the big eastern continent, to the north, between Haustvald and The Runewood (the names on the map) there is a huge building-complex, on the southern outside of it, is a ledge overlooking water (on the map there are two ships down below). On that ledge, there is a little vrykul-village. There hides the scoundrel. Kottr Vondyr is located in Trommheim. 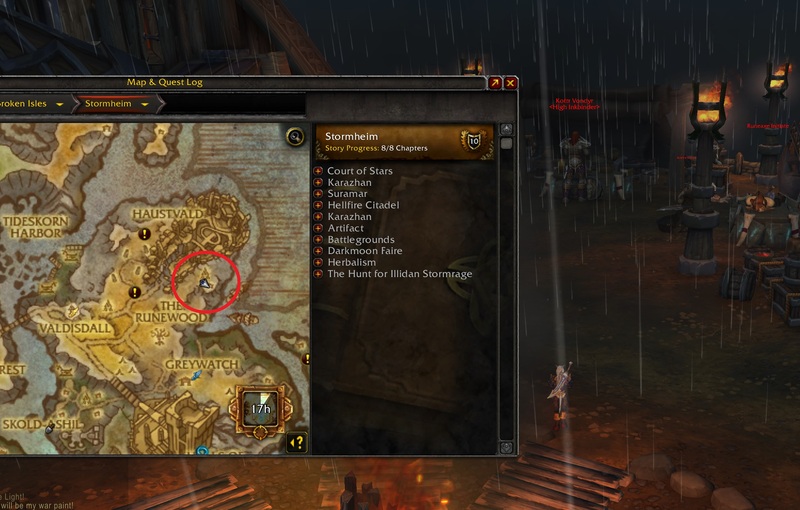 Alliance/Horde: if you start in "Valdisdall", go east until you reach the "Runeswood". Go north, east of "Hausvald", where you will find a camp on the "Inkbinder's Rise". Kottr Vondyr is at the back of the camp. Alliance: if you start in "Greywatch", take the exit to the west and then turn right to the "Runenwald". Go north, east of "Hausvald", where you will find a camp on the "Inkbinder's Rise". Kottr Vondyr is at the back of the camp. no one commented how the Inkbinder Kottr Vondyr is a referenco to real-life and celebrity tattoo artist Kat Von D?